If you’ve recently lost a pet, you are understandably in the deep stages of grief. Dogs with whom we’ve spent countless days caring for leave a serious void in our lives when they are gone. For each of us, the process is different. Some feel that another pet would be out of the question. Others feel that bringing a new pet into the home will help fill that void with that special, unconditional love and energy. If you are in the Sarasota area, there are some options for you to connect with others who have also experienced loss. 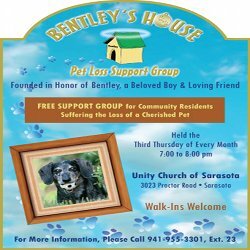 Bentley’s House Pet Grief Support Group is re-opening! Unity of Sarasota, 3023 Proctor Rd. 34231. Call 941-955- 3301 ext. 27 for more information. experiencing. If it is recent or happened a year ago it is real and we are here to help. empathize with all of them. Feel free to bring pictures to share and the stories that are near to your heart. Our pets are family and when we lose one we must find a place where we can share openly about all feelings. Often our spiritual background is what helps us through this and there is no wrong way to believe. There are no rules except acceptance and compassion. They meet monthly on the third Wednesday of every month from 7pm-8pm in the Community Room at Firehouse #2, 2070 Waldemere Street in Sarasota. You’ll be welcomed here by other people who know exactly what you are going through. Sometimes writing about your dog can help. 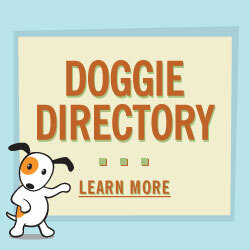 As you remember the moments of true connection with your pet, funny anecdotes and your dog’s habits writing them down can help. The process may help you frame your special relationship and share the joy of your pet’s personality with others in the community. 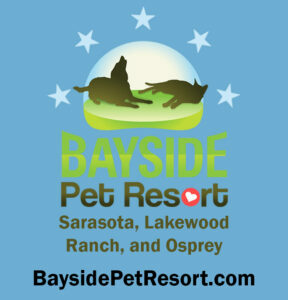 We’ve created a special place on SarasotaDog.com to host your written memorials. You can write it online and include a picture too. You don’t have to use your name if you choose not to. Tell us about your special pet, personality and things you did together – and feel free to share a picture. Because our pet’s life spans are shorter than ours losing a pet is part of the ownership process. It’s hard. It hurts. But, you are not alone and with this community you are not alone. 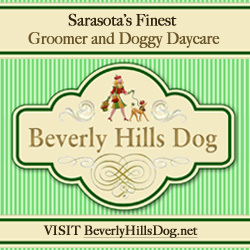 Oh, and while this is Sarasota Dog, we also appreciate that other furry and feathered friends can play a major role in our lives and should be honored as well, feel free to tell their stories here too.